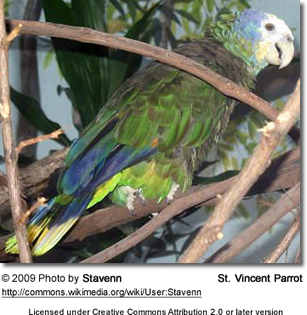 The Saint Vincent Amazons (Amazona guildingii) - also known as St. Vincent Parrots - are native to the Island of St.Vincent in the Carribean Lesser Antilles, where they can be found in humid hill forests at levels mainly between 1,000 and 2,300 ft (300 m and 700 m). This species is very endangered, with a population of fewer than 500 birds remaining in the wild, because of habitat destruction, hunting and illegal trapping for the pet trade. 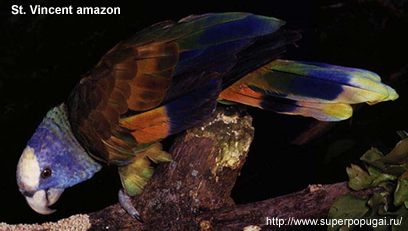 This large and multi-colored amazon averages 15.75 to 16 ins (40 cm) in length from head to tail. 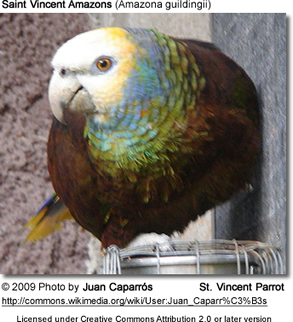 The forehead, forecrown, lores (the regions between the eyes and bill on the side of a bird's head) and eye area of this amazon parrot are yellowish-white merging into orange to back of crown, cheeks and throat. The ear-coverts (feathers covering the ears) and the rear of cheek are violet-blue. The nape (the lower back of the neck) is green to olive-green with bluish tinge and edged with black. The breast and abdomen are bronze-brownish, each feather with narrow black edging. In many birds, the abdomen has a greenish tinge. The under tail-coverts are greenish-yellow. The back, shoulders, lower back and upper tail-coverts are bronze-brown to olive-green. 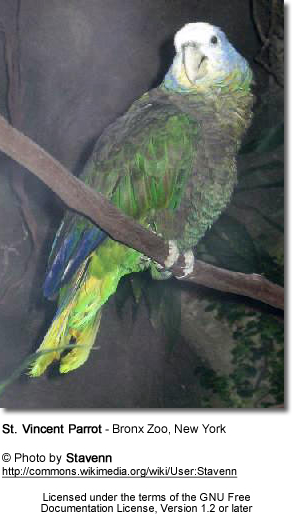 The upper tail-coverts have green tips. The edge of wings is orange. The outer primary wing feathers are dark green with green to violet-blue outer webs. The inner primary wing feathers are green. The primaries (= longest wing feathers) are black with green to orange base with outer webs becoming centrally yellow to orange. The tips to outer webs have a violet-blue tinge. The outer secondaries (shorter, upper "arm" feathers) are violet-blue with orange base. The inner secondaries are dark green with violet-blue tips. The secondary-coverts are orange-brown to olive-green with green base. The median and lesser wing-coverts are bronze-brown to olive-green. The lesser under wing-coverts are bronze-brown to green with green to pale blue edging. The greater under wing-coverts and underside of flight-feathers are yellow to green. The tail-feathers are violet-blue with orange base and broad yellow to orange tips. The bill is horn-colored and the irises are orange-red. The feet are grey. Gender id: Males and females look alike. Immature birds look like adult, but their plumage is generally lighter and duller; and their irises are brown. There is a less yellow-brown morph (genetic mutation) and a less common green morph. Its diet consists mainly of fruits, nuts, flowers and seeds. They are particularly active in the early mornings and afternoons. They quickly grow trusting with their care taker. They are medium-noisy to noisy -- which also should be considered if neighbors are close-by. They enjoy bathing and are heavy chewers. This needs to be taken into consideration as far as aviary construction is concerned. Plenty of branches should be provided to them to satisfy their urge to chew. Once acclimatized, these amazons become very hardy and easy-to-care for and breeding has been achieved on several occasions. Their breeding season starts in spring. The hen usually lays a clutch of 2 to 3 eggs, of which 1 to 2 eggs are frequently infertile. She incubates the eggs for 25 - 26 days and the young fledge the nest when they are about 9 to 10 weeks old. At a minimum, they should be in an outside flight 18 x 6 x 8 ft (6 x 2 x 2.5 m) with adjoining inside area 6 x 6 x 8ft (2 x 2 x 2.5 m). As they are heavy chewers, metal construction is essential. The nestbox dimensions should approximate these: 16 x 16 x 32 ins (40 x 40 x 80 cm).